iPad mini, iPad 3rd Gen, iPhone 5, etc. As soon as we got our hands on the 4th Gen iPad and iPad mini (November 2nd), we rushed to get these benchmark results to you. Geekbench 2 runs two processor tests (integer and floating point) and two memory speed tests. Below is the overall rating. HIGHER number is faster. RED bar indicates fastest device in this test. Linpack Benchmark measures how fast a device solves a dense N by N system of linear equations Ax = b, which is a common task in engineering. The solution is obtained by Gaussian elimination with partial pivoting, with 2/3�N3 + 2�N2 floating point operations. The result is reported in millions of floating point operations per second or Mflops. HIGHER number is faster. RED bar indicates fastest device in this test. GLBenchmark 2.5 is a graphics performance testing utility. The first graph is the Egypt HD animation run at 1080p with complex textures -- OFFscreen -- to make it fair since the devices tested have different screen resolutions. To see how the iPad 4th Gen compares to all mobile devices, visit the GLBenchmark Results page. HIGHER number is faster. RED bar indicates fastest device in frames-per-second (FPS). This next graph is the same Egypt HD run in ONscreen mode at the native resolution of each device. Is 1024x768 vs 2048x1536 a fair fight? No, but that's the way your games and other animated graphics will be running -- ONscreen and at native resolution. Note the iPad 4 and iPhone 5 are able to handle the "heat" even with their very high Retina pixel density. HIGHER number is faster. RED bar indicates fastest device in frames-per-second (FPS). The 4th Gen iPad delivers what speed junkies crave, coming in fastest overall. The iPhone 5 comes in second and the 3rd Gen iPad comes in third. The iPad mini with its 7.9" screen is cute and draws a crowd when we whip it out. 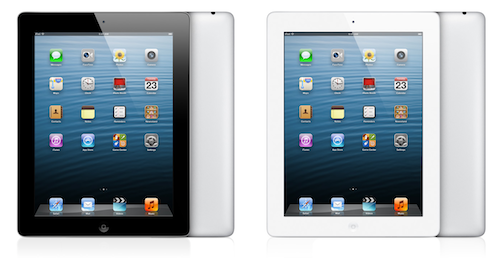 We prefer the larger 9.7" Retina screen of the iPad 3 and 4. If cost is your concern, consider a Apple Certified Refurbished iPad 3. The iPhone 5 is our kind of "mini" with great speed and a Retina display. Anandtech does an in-depth examination and testing of the iPad 4's GPU (PowerVR SGX 554MP4). GOOGLE NEXUS 10 -- iPAD 4 'KILLER'?